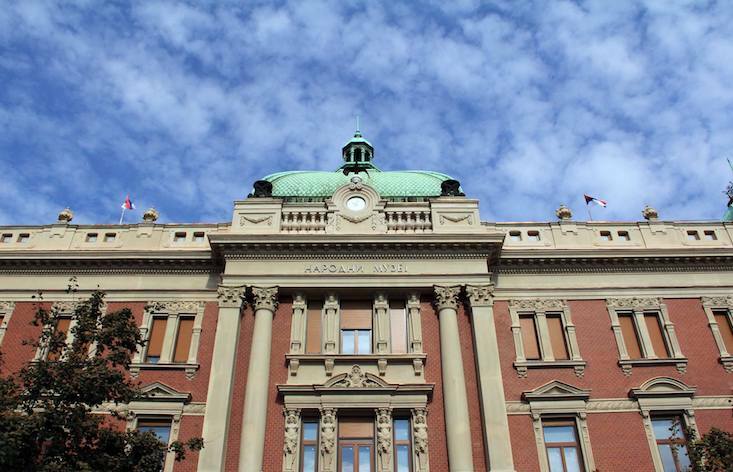 Serbia’s National Museum will open its doors for the first time in more than 15 years in a grand opening ceremony celebrating a new chapter in the country’s cultural landscape. A video installation starring ballet dancer Sergey Polunin will be beamed across Belgrade’s Republic Square before the first visitors are ushered in at 11pm on Thursday 28 June for a special 24-hour opening. The museum’s long-awaited restoration, which included an interior design revamp and works on the building’s facade, has been plagued by bureaucratic and financial setbacks since the building closed in 2003. Politicians had originally committed to reopen the building in 2015, even fitting a countdown clock on the museum in the heart of the capital before quietly removing the long-expired timer. The city’s refurbished Museum of Contemporary Art suffered a similar fate, shutting its doors for more than a decade before its reopening in October last year. The museum’s new permanent exhibition will select the best of the institution’s 400,000 artefacts, guiding visitors from the Bronze Age to the modern day. Staff say that new programs will focus on rebuilding the museum’s connection with young people. “More than 30 curators worked on the exhibition with the desire to show exhibits which bear wonderful stories about the area in which we live,” said Museum Director Bojana Borić Brešković.